May is National arthritis month. What does that have to do with psoriasis and eczema you ask? Just ask the 1 million Americans who suffer from Psoriatic Arthritis and they will tell you it has a lot to do with it. Up to 20% of people suffering from psoriasis will also develop an arthritis in association with their skin condition. It is called Psoriatic Arthritis and it is usually seen in the 30 – 50 age group. It affects both men and women equally. The symptoms of psoriatic arthritis are similar to those of rheumatoid arthritis, although they are often not as severe. They include pain, stiffness and swelling in and around a joint, decreased movement, morning stiffness and tiredness. With so many people affected by psoriasis and psoriatic arthritis in America alone it is amazing that the Federal Government spends just $1 per patient annually researching psoriasis and psoriatic arthritis combined. Last week the US Food and Drug Administration (FDA) approved a new medication to reduce the signs and symptoms of active arthritis in patients with psoriatic arthritis. The drug Remicade (infliximab) (which was first approved for use in Rheumatoid arthritis in 1999) is a biologic drug and is a combination of mouse and human substances. Remicade neutralizes the biologic activity of TNF-alpha by binding to it. Researchers have found that this TNF-alpha is involved in the inflammation pathway of rheumatoid arthritis. 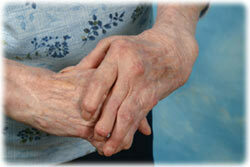 Psoriatic arthritis closely mimics rheumatoid arthritis. Remicade is given by intravenous infusion. The effects of Remicade last for the 8-week period between infusions. Psorisis Cure Now has been educating Congress about the need for a more significant commitment to psoriasis and psoriatic arthritis research. Let’s hope in the future that we will see an increase in the amount of federal funding offered to these conditions.